St Helens thrashed. Unfortunately for them, and Super League, that has been the theme of the World Club Series these past two years. A new-look Sydney Roosters, with an inexperienced halves pairing of Jackson Hastings and Jayden Nikorima, were superb at times. Read Phil Cartwright's report of their 38-12 victory at Langtree Park here. However, Saints boss Keiron Cunningham will bemoan another game littered with errors and poor kicking. There were times when the Super League side's defence were up to the task and muscled up in a big way, but then there were others where they yielded too easily. Sydney Roosters' win puts Australia 1-0 up in the World Club Series and the question is, will it be another clean sweep by the tourists? 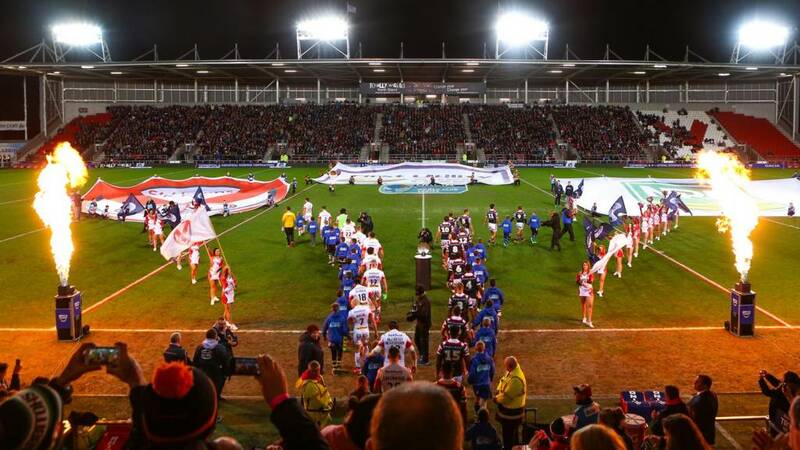 Join us again tomorrow from 19:30 GMT for live text and radio commentary of Wigan Warriors v Brisbane Broncos. * Hooroo, for the record, means goodbye. St Helens boss Keiron Cunningham told Sky Sports: "I thought we started outstanding. I asked my players to respond after last week and I thought the pack was the best on the field and we were really physical in all aspects of the game. "We are playing against a very good side and very clinical side. Their outside backs were brilliant. "I've never seen so many tries against the run of play and the Roosters are a world-class side. You have to execute everything and be clinical. "It wasn't a true reflection of the game. I'm proud of my players." So Sydney Roosters have won the World Club Series opener, but there are two more cross-competition matches to look forward to this weekend, culminating with Sunday's World Club Challenge showpiece between Leeds Rhinos and North Queensland Cowboys. Saturday sees newly appointed England boss Wayne Bennett take his Brisbane Broncos side back to Wigan for a rematch, after claiming a dramatic win at the DW Stadium 12 months earlier. On Sunday, will a modern-day rugby league great in Johnathan Thurston help the Cowboys conquer the world or can a wounded Rhinos side overcome a injury crisis to pull off one of the great World Club Challenge upsets? Join BBC Sport for live text and radio commentary of both matches. Quote Message: Saints had a couple of good periods early on and, when the Roosters were down to 12 men when Dylan Napa was sent to the sin-bin, they looked like they might mount a little bit of a comeback. But over the 80 minutes they made too many mistakes and they were simply outgunned by a better team. Saints had a couple of good periods early on and, when the Roosters were down to 12 men when Dylan Napa was sent to the sin-bin, they looked like they might mount a little bit of a comeback. But over the 80 minutes they made too many mistakes and they were simply outgunned by a better team. Sydney Roosters captain Jake Friend told Sky Sports: "We didn't know a lot about St Helens, but we knew they would throw a lot at us and that they have been at the top of Super League competition for a few years. "They came out firing and we weathered the storm early and got a roll on in the first half. "One of the biggest positives was watching the young blokes - Jayden Nikorima, Dale Copley and blokes like that - they all played well and it was great to see them get a crack." Sydney Roosters prop and man of the match Kane Evans told Sky Sports: "We knew they were a tough team and, to come out here and get the win, we are very pleased and happy with our performance. "It was hard work and we ground out the match - their forwards are big tough boys and we are glad we got it." Quote Message: The Roosters have done a really efficient job, scored some brilliant tries, played with a lot of control and patience, been really strong in their defensive systems and made it difficult for St Helens to make any headway. The Roosters have done a really efficient job, scored some brilliant tries, played with a lot of control and patience, been really strong in their defensive systems and made it difficult for St Helens to make any headway. Sydney Roosters open the World Club Series with an easy win, running in seven tries against St Helens at Langtree Park. Aieden Guerra touched down twice, helping give the Australians an early lead in this year's series. Just two minutes remaining and bodies looking tired at Langtree Park. Sydney Roosters, in their first competitive hit-out of 2016, looking polished even now. St Helens failing to make good use of possession, with their kicking game letting them down time and again. Attention will be turning to the record books again as no team has conceded more than 44 points in any World Club match. At this rate, Saints could be on their way to another unwanted piece of history... Or can they settle things down late on? No. It can't be. Can it? Yep. The re-start goes out on the full again and Sydney Roosters are handed possession on the half-way line. St Helens really are inviting a lot of pain on themselves tonight. Intercept from an Atelea Vea pass and Daniel Tupou turns on the jets, running almost the entire length of the field to add misery to St Helens' night just when things were looking up. Great instincts and impressive speed by the try-machine. Roosters full-back Blake Ferguson needing to rush the ball out of play as Tommy Makinson's kick hangs up in goal. Saints looking increasingly dangerous and go again at the Roosters' defence with a goal-line drop-out. With a numerical advantage, St Helens show a willingness to play with the ball in hand and shift it with some confidence. Dominique Peyroux collects out on the right and he edges over for his and Saints' second score. Luke Walsh with a fine conversion. Roosters forward Dylan Napa with a stray arm and it is a high hit and he he is sin-binned. Can Saints make the most of the man advantage? Mistakes blighting the game a little right now. Both sides relinquishing possession, but it is Sydney Roosters that throw away a try. Daniel Tupou looked as if he strolled in for the Australians, but the ball went forward as it touched Dale Copley on the way out to the left. Steve McNamara, now the ex-England coach, must be pleased with what he's seeing at Langtree Park. McNamara is part of Trent Robinson's coaching staff at the Roosters. Nothing going right for St Helens. Jack Owens launches the re-start dead and Sydney Roosters are invited back upfield with a penalty. With a skip, hop and twist of his body, Sydney Roosters second-rower Aidan Guerra goes in for his second try. St Helens' defence brutally exposed by size and some quick ball movement on the right again. Quote Message: Nikorima, who went off in the first couple of minutes with a head knock, has picked himself up off the canvas and come up with some very important plays. He looks like he's got plenty of potential. Nikorima, who went off in the first couple of minutes with a head knock, has picked himself up off the canvas and come up with some very important plays. He looks like he's got plenty of potential.